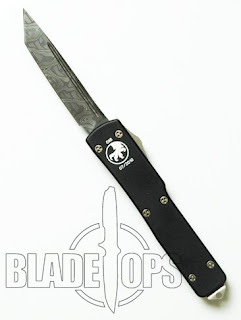 Occasionally, Microtech will produce a special run of knives. Just a day or so ago, we put the newest special run of out the front knives that Microtech has produced into stock. The UTX70 with a Damascus blade is an amazing piece of art, as well as being a great knife. The MT149-DAM is a limited run edition of UTX70’s that have a Damascus steel blade, with a tanto point, as well as bronzed hardware. The 70 is a very small version of the ever popular Ultratech knife that has been the flagship knife for Microtech for so many years. This knife measures in at 6.75″ when fully open and the blade is 2.375″ long. One of the smallest production OTF knives currently on the market, if not the smallest, this model is sure to become an instant collector’s classic. It is made by Microtech, it is part of a limited run, it has a special Damascus blade, and it has the bronzed hardware. Get your’s while they last–they are going very fast. Previous Previous post: Tumult OTF Knives back in stock!